In January, I was gifted a block of vegan Miyokos cultured cashew & coconut oil based butter. I got so excited about the rich, not-earth-balance flavor of the stuff, that I went ahead and tested it out in a recipe that depends most on a flavorful fat —pie crust. After the holiday season, I wasn't very keen on another pie, so I went for the something vaguely similar and whipped up a batch of pop-tarts. They turned out sooo darn good that I made them a second time, and then a third, and a fourth, and I've now lost track of how many times I've been to Trader Joe's to pic up another block of this magical butter. So far, I've experimented with strawberry, s'mores, brown sugar cinnamon, and my personal and forever-favorite: blueberry. I took out my camera and shot these photos, promising everyone a recipe within a week of sharing on social media, and then... life happened. I let the photos sit here, edited, in this draft for two months while I crammed all the baking jobs I could into my busy schedule and neglected the heck out of this post, and my readers! I am so sorry to everyone who strolled through the breakfast isle in the grocery store and let out a gaping sigh before reaching for the boxed Kellogg's pop-tarts because I failed to release my recipe. Alas! 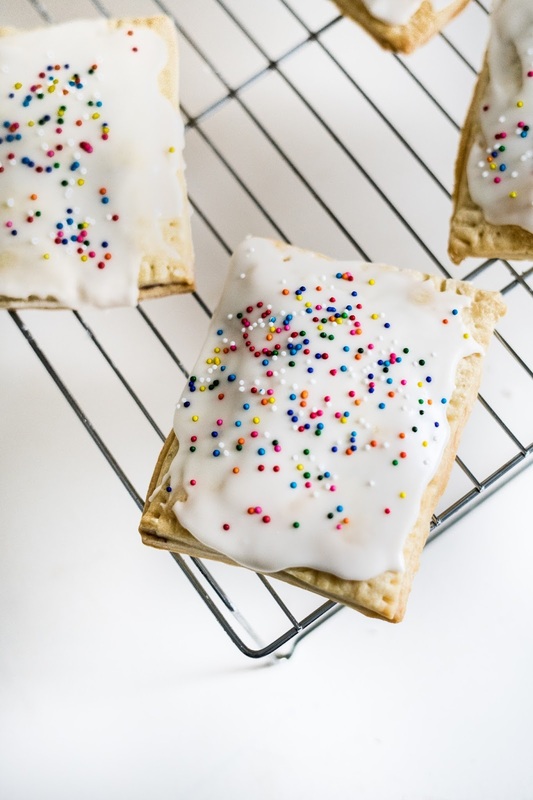 The recipe is here and you all can finally snag that vegan butter from the refrigerated section and leave those legendary, but completely processed pop-tarts on the shelf. These beauties are 110x more fresh, tasty, and vegan. I promise they're worth your time, but I can't promise they'll last longer than it took to make them (unless you hide them from everyone else). 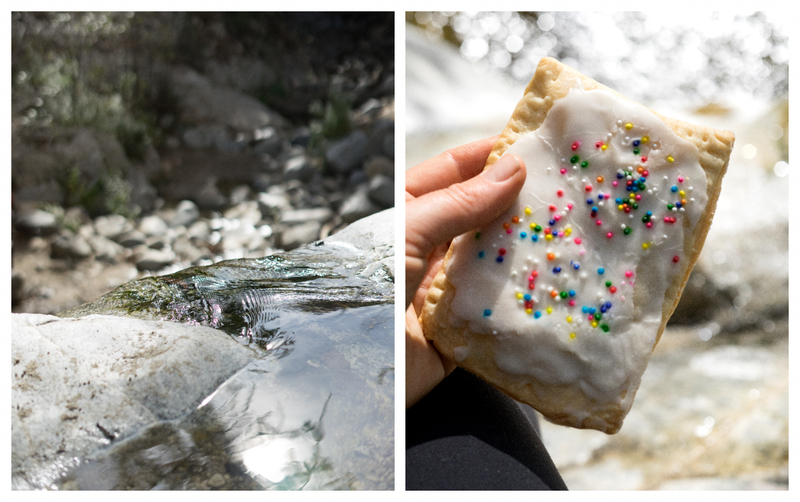 I made a batch of these pop-tarts with the intention of taking them on a sunrise hike, but again, life came running at me in full speed and my body needed rest, so the sunrise hike turned into a mid-day hike, oh well. 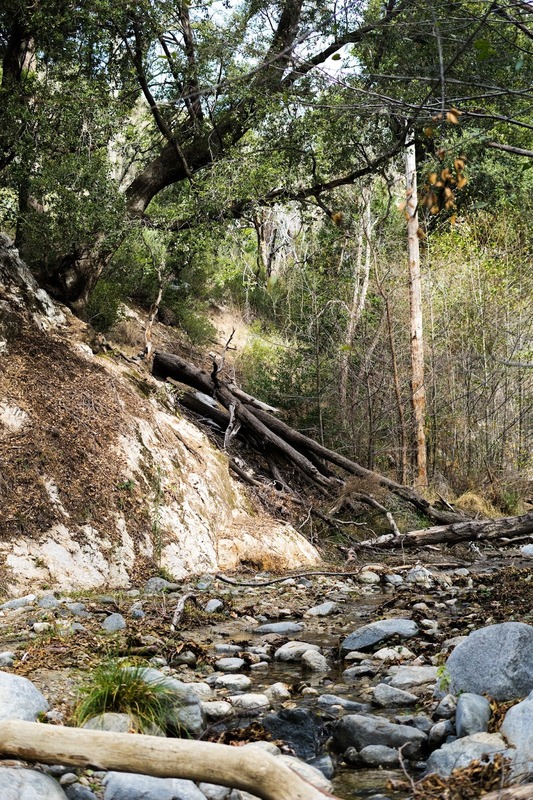 I still stopped by work (a coffee shop) and filled my hydro flask with hot coffee and continued onto the mountains, venturing to a waterfall so I could eat blueberry pop-tarts and sip my mid-day coffee in peace. I'm still figuring it out. How to work full time, run a cake business, create recipes to blog about, travel the states, be a freelance writer, a runner, a yogi, a friend, a daughter, etc. It's been a crazy year thus far. I feel like every day is a race against time and I keep trying to cram as much as possible into one day. It's ridiculous and stressful, and I'm so happy to be laying here, on this couch, finally making time to work on my own projects. Thank goodness. 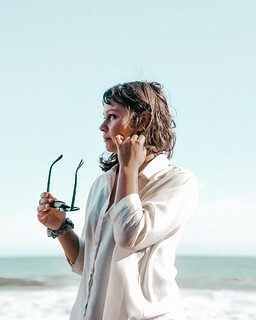 Here's a little playlist with songs I listen to when I need to slow everything down. 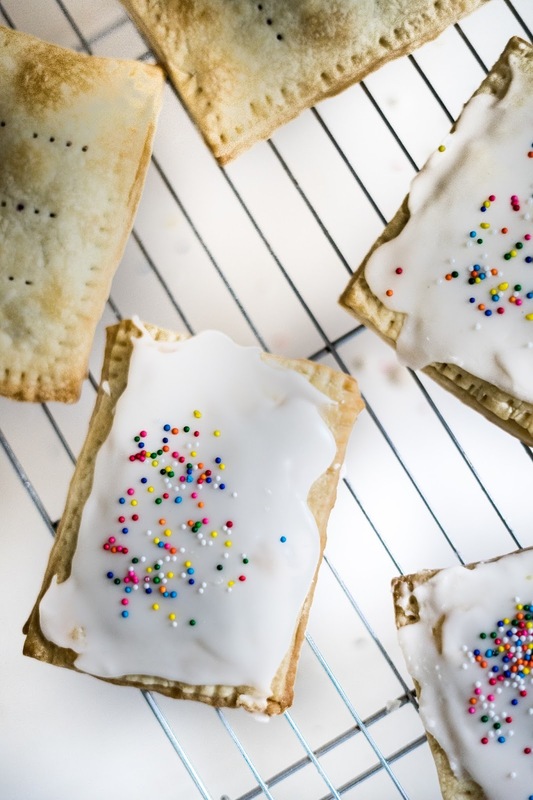 Again, these pop-tarts are made using Miyoko's vegan European-style cultured butter. It's gotta be the best vegan butter I've ever used (sorry Earth Balance). This butter is made up of a blend of cashews and coconut oil and the flakiness it lends to pie crust is unreal. Also, pro-tip: it's attainable at Trader Joes (and whole foods, but sometimes you have to ask someone for it because they don't always put it on the shelf). Begin by making the crust. Combine flour and salt. Cube the cold butter and rub it into the flour mixture with your fingers or a pastry cutter until the butter is pea-sized. Add the ice-cold water to the mixture and mix with a wooden spoon until a dough is formed. The dough should be shaggy, but moist and smooth enough to form into a ball. Flatten the ball of dough into a disc and cover with plastic wrap. Refrigerate the dough for at least one hour. Meanwhile, make the blueberry compote by placing the blueberries, sugar, and chia seeds in a saucepan over medium heat. Cover and cook for 5-8 minutes, stirring occasionally. Then, transfer the compote to a bowl and stir in vanilla. Let cool. When the dough is finish chilling, turn it onto a lightly floured surface and use a rolling pin to roll the dough into a 1/8" thick rectangle. 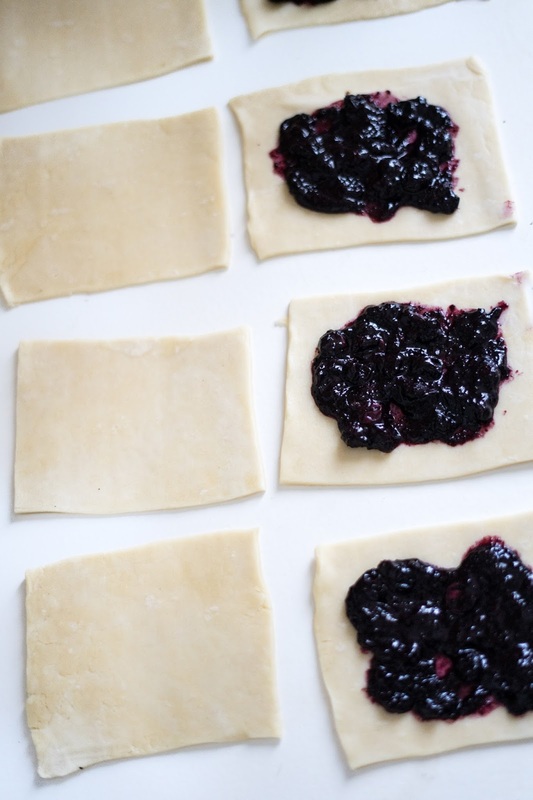 Cut 10 equal rectangles from the dough and transfer onto a baking sheet. Place about 2 tablespoons of filling on half of the rectangles, leaving a 1/4" border around the edges. Rub a small bit of water around the edges and place the tops on each filled pop-tart. Seal the edges by pressing them together lightly with a fork. Poke a few holes in the top of each pop tart and brush with almond milk. Place the baking sheet of pop tarts in the freezer for about 10 minutes while the oven preheats. 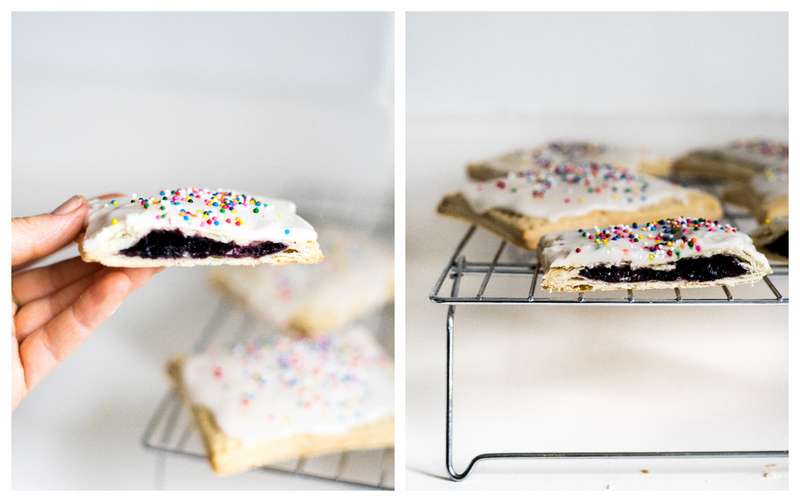 Bake pop tarts for 15-20 minutes or until lightly golden. Then, let cool completely. Make the glaze by combining the powdered sugar, vanilla, butter, and almond milk, stir. Top each pop tart with the glaze and sprinkles. Store pop-tarts in a sealed container for 5 days.